There is perhaps no greater gesture of goodwill than sending someone a free cheeseburger through a smartphone. Delivery app Postmates knows this, which is why it has teamed up with Shake Shack for a deal that allows you to recoup a free cheeseburger if you send one to a special someone. 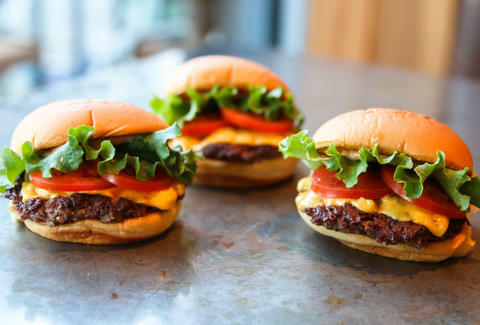 Yes, it is true: you get a free cheeseburger and they get a free cheeseburger. For the deal to work, you have to be an existing Postmates user and refer a friend to the app. After using a promo code to send a free ShackBurger to your friend, you'll receive a $10 credit towards your own ShackBurger. Cheeseburgers shall fly back and forth. The deal is good all week -- from Monday, December 11, to Sunday, December 17, so you have plenty of time to make someone's wildest lunch dreams come true by virtue of a burger delivery. If you're in less of a giving mood and want to be the sole recipient of the many benefits offered by this blessing, then you're still in luck. That's because Postmates is also offering free Shake Shack delivery through from now until Sunday. That means whatever you order at Shake Shack via Postmates will come with no added delivery charge. Both the free delivery and free burger deals are available in the following 17 cities: Atlanta, Austin, Baltimore, Boston, Brooklyn, Chicago, Dallas, Houston, Los Angeles, Las Vegas, Miami, New York City, Orlando, Philadelphia, Phoenix, San Antonio, and Washington, DC. After all, it is the holiday season, so giving to others should be foremost among your priorities. You can ask for your free burgers to be dressed up in ribbons if you like, although that'd likely just be annoying for everyone but you.